The U.S. women won their first major title since 1999. The U.S. women's soccer team is golden again. 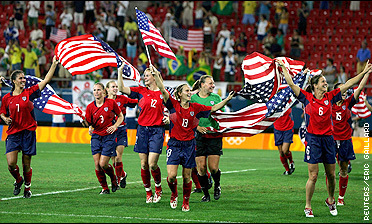 In the final international game for at least three retiring players, including Mia Hamm, Abby Wambach's goal in the second overtime lifted the Americans past Brazil 2-1 on Thursday. And Briana Scurry found a little redemption. Iraqi and Italian soccer players planned to wear black armbands on their uniforms during their Olympic bronze medal game Friday in honor of an Italian journalist killed in Iraq. Everyone is rooting for the Iraqi soccer team, while Team USA is the one people want to lose. The Iraqi soccer team is one victory away from an improbable trip to the podium. Now that she's decided to retire, Mia Hamm's last international game could be days away. So whatever happened to Brandi Chastain? Michael Lewis, in Greece, has the answer. Abby Wambach's on fire on the U.S. team's forward line, netting 16 goals in her last 17 games. There have been bigger upsets in Olympic history, but there have been few as important as this one. In its first Olympic competition since its country was shattered by war, Iraq upset Portugal 4-2 on Thursday in a gritty, come-from-behind victory as about 200 chanting fans cheered and jumped wildly. The president of the world soccer body said Monday that the yellow-card suspension rule has been changed for the Olympic women's tournament. Portugal striker Luis Boa Morte has been banned for his country's two remaining group matches in the Olympic soccer tournament after being ejected from their opening 4-2 defeat by Iraq. U.S. national team members Brandi Chatain and Heather Mitts stopped by ESPN.com to chat on July 30. Mia Hamm, soccer's most prolific all-time scorer, is leaving the game in high spirits both personally and professionally. The Athens Games are the last hurrah for at least three players who have defined U.S. women's soccer. Greece's victory at the European soccer championship last week has united Greeks and they are now confident the Olympic Games will be a success, according to a nationwide poll published Sunday. Tiffeny Milbrett has quit the U.S. national women's soccer team, saying she can no longer play for coach April Heinrichs. Iraq's soccer team qualified for the Athens Olympics on Wednesday, less than three months after the country was reinstated by the International Olympic Committee.